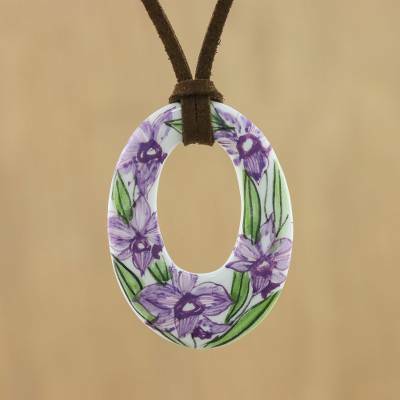 Ceramic Thai Handmade Lilac Floral Pendant Necklace, "Lush Lilac"
Expertly crafted from ceramic in a unique, oval shape, this pendant necklace by Thai artisan Napat Chotpruekchookul is a cheerful rendition of a bed of lilac-colored flowers and lush, green leaves. The pendant hangs from a faux suede cord that can be knotted at the desired length. Napat rescued her family's dying ceramic workshop with the introduction of ceramic jewelry as a new collection. Additionally, she has used her background in environmental science to build a sustainable eco-friendly model. She employs several local artisans and technicians in her workshop. "I want to make my workshop the best place to work and for all of us there to be happy. I believe that when we are happy, the outcome of our work will be beautiful." "I was born in 1966 in Lampang province in Northern Thailand. Ceramic work is one of our local specialties and it's known for its beauty and quality. "I graduated with a master's degree in environmental management and technology, and worked as an environmental research assistant for a while. Then I decided to leave that job because I wanted to rescue my family workshop where orders had fallen significantly. Our competitors in China can reproduce our designs with cheaper prices. And we found we were unable to sell our ceramics. "I made a commitment to revive my family economy and at the same time I wanted to help to preserve our original ceramic arts. I started applying what I learned at the university, and studied further by myself as I sought to bring modern technology to an ancient craft. "My first idea was that, if we can create something unique, it would be more self-sustainable in the long term and would reduce the risk of price competition. And — more important — we'd be able to work happily without worries. "For all these reasons, I decided to begin creating ceramic jewelry. Personally, I've always like art and design. My designs are 100% handcrafted from hand-mixed kaolin. I prefer this clay because its color is off-white after firing, which is better for drawing a pattern than other types of soil. We draw and paint the motifs by hand before glazing and firing the piece again to get clearer color pattern. Then I assemble the pieces to make jewelry. "I started my ceramics seriously in 1997. I have a duty to design and produce unique items. My husband is responsible for finding places to sell our work and he helps with research to make sure our designs are different. I'm very proud of my jewelry — much it is unique, beautiful, and shoppers like it. Furthermore, I was able to turn around a difficult situation for my family. Today, I'm even able to help generate income for the people around my workshop. "I've been concerned about the environment since I studied at the university. So I not only focus on the beauty of my work but also on the environment. I make sure that our color pigments and other materials do not contain dangerous chemicals. We have been certified as 'Eco-Friendly Made' by Thailand's Ministry of Natural Resources and Environment since 2015. "I want to make my workshop the best place to work and for all of us there to be happy. I believe that when we are happy, the outcome of our work will be beautiful, with good quality. At present, I have eight technicians working with me and all of them are local people who love what they do. So they do their best with each piece of jewelry."